Thank you for your interest in Fantastic Curriculum – Zorgamazoo Study Guide. 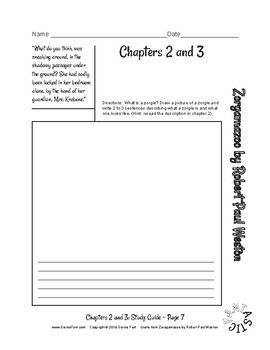 This literature study packet will make it easier for you to teach the novel Zorgamazoo by Robert Paul Weston. Zorgamazoo is an amazing novel that is written entirely in rhyme. It is a great book to study at home as a family or with your students in the classroom. What I love the most about this story is that the content is exciting but the vocabulary is sophisticated and challenging. Sorina Fant’s Fantastic Curriculum – Zorgamazoo Study Guide includes 53 pages of an intensive study of each chapter in the novel. There is a combination of writing activities, drawing activities and vocabulary review in each chapter study. 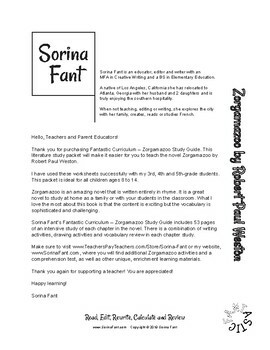 Make sure to visit www.TeachersPayTeachers.com/Store/Sorina-Fant or my website, www.SorinaFant.com, where you will find additional Zorgamazoo activities and a comprehension test, as well as other unique, enrichment learning materials.